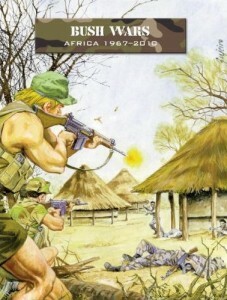 Ambush Alley Games now has their Bush Wars: Africa 1967 - 2010 available as a .pdf download from their website. Ambush Alley Games and Osprey Publishing are proud to announce that the sixth companion book for Force on Force, Bush Wars, Africa 1967-2010, is now available for purchase in PDF format. With its many tribal, political, religious, and cultural divisions, Africa has long been a continent at war - both with itself and with others. For much of the 20th century, there has been a near-constant state of military unrest, from Cold War proxy wars with Soviet and Western powers supporting their African allies in live-fire incarnations of this ideological struggle, and revolutions against established regimes, to foreign interventions under the banner of peacekeeping and mercenary operations alike. Bush Wars brings this hotbed of unrest to the wargaming table, with scenarios, orders of battle and background information. While written with Force on Force in mind, the scenarios in Bush war are useable with any small-unit rule set.